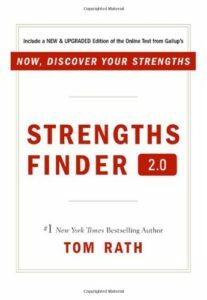 This book and the included test identify your top five strengths and explain how to maximize them. The authors advocate working on your strengths rather than your weaknesses, arguing that you will only see marginal improvement if you try to strengthen a weakness, whereas you can polish a strength to genius level. I am not sure I am 100% on board with this theory, but I found the test to be quite helpful and more enlightening than personality-based tests like the Myers-Briggs. For example, one of my strengths is Relator, which means I prefer to deepen relationships with people I already know. This helped me accept why I don’t enjoy small talk or “socializing” and prefer to talk about more meaningful things in any conversation. This test can help with self-acceptance, and by giving yourself permission to shine with the talents that are uniquely yours. The book includes specific suggestions for each strength which includes which kinds of folks have complementary strengths that you should pair up with and how others will react to your strength. For instance my top strength was “Ideation” – a love for and facility with ideas – and it suggests that some folks might not follow my leaping train of thought so I’ll need to connect the dots for them. That’s good to remember. I am not sure sometimes if all my strengths are inborn talents or which ones are the result of coping with trauma. For example, Strategy was one of my top strengths. This can be helpful in business, but I notice that my tendency to strategize in relationships has overtones of manipulation and seems rooted in codependency and fear rather than shiny happy strengths. But one could argue that this is merely a healthy strength that got “corrupted”. Still, I would have appreciated some discussion of “strengths gone overboard” or when you need to reign in your strength or balance it with other strengths. I enjoyed the way this philosophy celebrates diversity by promoting the idea that we all have different strengths and we need to work together so we can benefit from others strengths in areas we are weak in. I think this is a great model for the workplace. Note: be sure to buy a new copy of the book as there is only one test code per book.